Both films share a similar story, based (in Ford’s case loosely) on true events. A young woman is kidnapped, and a search party is dispatched to hunt down the kidnappers and their prize. Ford’s story takes place in the late 1860s in what is now West Texas, but at the time was the Comancheria, the vast territory of the Comanches, Kiowa, and several other nations. Kunuk’s film is set in the early 20th century in a remote part of Nunavut, in the far north of Canada. Each film revels in the expansive landscape, often positioning characters against the endless land. Ford favors framing his characters in doorways, suggesting the gateway from civilization to savagery, while Kunuk prefers to prioritize the land itself, his subjects often dots against its vastness. However, the nature of those landscapes speaks to the difference in filmmaking approach and intended audience. 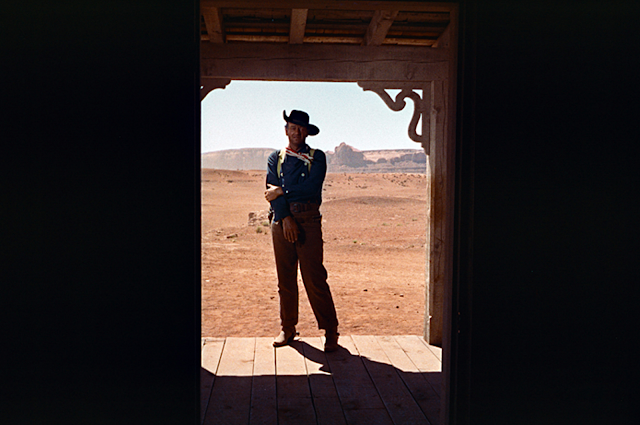 Ford’s landscape is a work of fiction, the film shot on a studio backlot and in his familiar Monument Valley setting in what is now Arizona and Utah, a topography that in no way resembles the story’s West Texas setting. 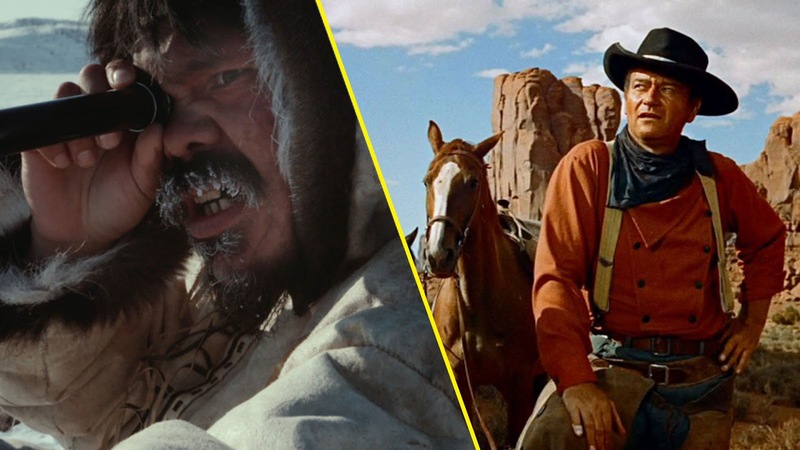 Likewise, Ford’s Comanches are largely played by Navajo performers. Kunuk’s film was wholly shot in Igloolik—as close as possible to the physical place where the true events would have taken place—using Inuit actors for all of the roles, and shooting the film entirely in Inuktitut. Kunuk’s Searchers also features a collaboration with his longtime friend and star Natar Ungalaaq, who starred in Kunuk’s breakthrough hit, the epic Atanarjuat: The Fast Runner (2002). But Kunuk casts the heroes and villains within families—this is personal politics, not colonial conflict, a retelling of a community story rather than a grand political statement. Kunuk also enlisted Inuk singer Tanya Tagaq to provide the film’s haunting score. The Searchers. Courtesy of Warner Bros.
Kunuk’s work is always rooted in community in a way that non-Indigenous movies, let alone large budget studio productions, rarely are. Kunuk pays unflinching attention to detail, enlisting his community’s artisans and craftspeople to create the physical elements of the film in the traditional way. This attempt at uncompromising authenticity suggests both the director’s desire for realism, but also the cultural preservation central to his work and ideology. His movies are reciprocal, both in telling stories never told onscreen before, but also in helping to maintain the cultural practices often depicted within them. Kunuk makes his films for his own community, far removed from the commercial demands of a studio, and as such his work stands as truthful representations of stories and people. Ford’s The Searchers may excel in its artifice and craft, but is nonetheless rooted in colonial deception. Kunuk’s devotion to the “Inuit way” means his films exist alongside the communities they depict, as living documents of contemporary practice as much as displays of traditional stories and existence. Kunuk’s Searchers is an example of what a decolonized Western is, except that in this case, it would be a Northern. BAMcinématek screens Beyond the Canon—Maliglutit + The Searchers on June 16, 2018 at 5pm, BAM Rose Cinemas, 30 Lafayette Avenue, Brooklyn. Jesse Wente is an Ojibwe writer, broadcaster, producer, and speaker born and raised in Toronto. He spent 11 years with the Toronto International Film Festival, the last seven as the Head of TIFF Cinemathèque, and recently became the first Director of the Indigenous Screen Office in Canada. Follow him on Twitter @jessewente.